Wave~Action™ System – Ordinary blenders spin contents around the walls of the jar, which can leave whole chunks untouched by the blades. The Wave~Action™ System has a unique container and blade design for smooth results every time. 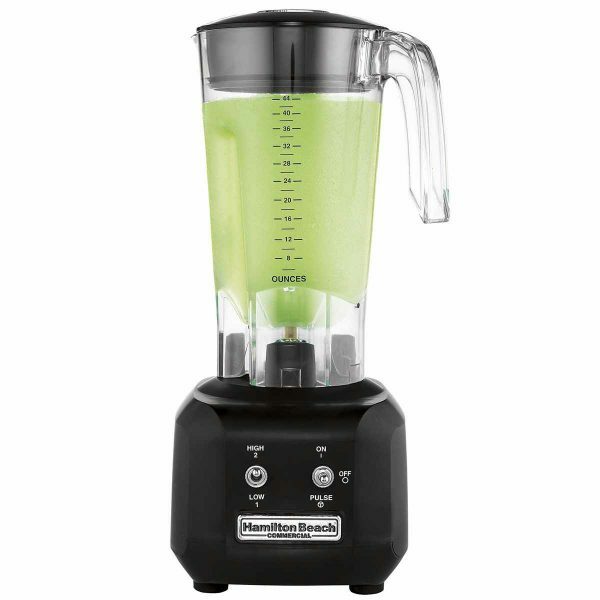 20 Second Daiquiri – When thirsty customers are waiting, you can blend 16 oz. drinks in 20 seconds flat. Two Speeds with Pulse Option – Offers versatility and precision blending for a wide variety of food and drink mixtures.- Breakresistant polycarbonate container with filler-cap and easy-to-read measurement marks makes filling and pouring easy. Durable Stainless Steel Blades – Four stainless steel blades are made to last and get the job done fast. 44 oz. Stackable Container – Break resistant polycarbonate container with easy-to-read measurement marks stacks up for storage.